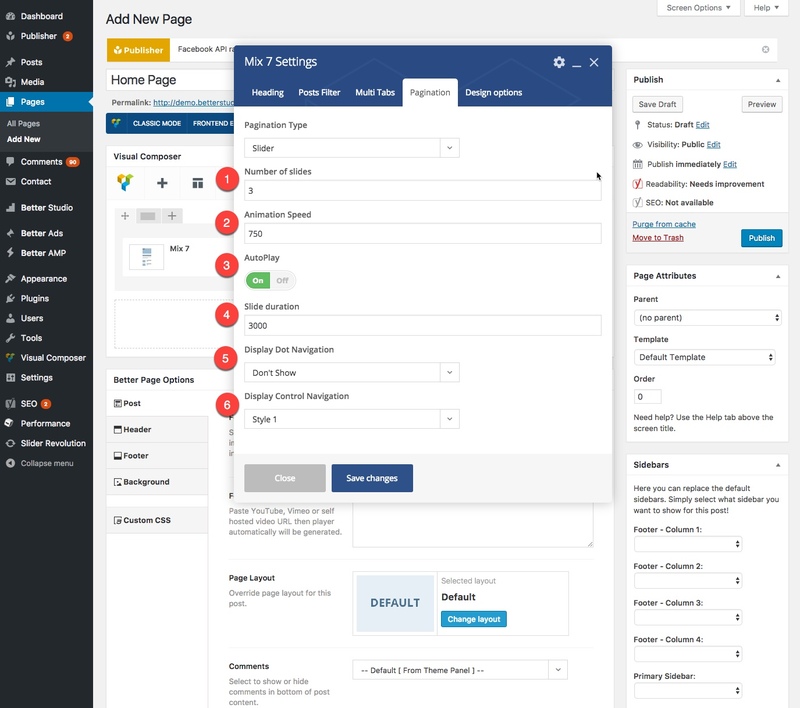 When you add a new content block as described in How to use content block?, a modal shows up with some tabs. Most of them are common between content blocks but there are exceptions like Slider content blocks. There is an option for showing more posts as slider in other blocks, so slider concept is some kind of common between all blocks. 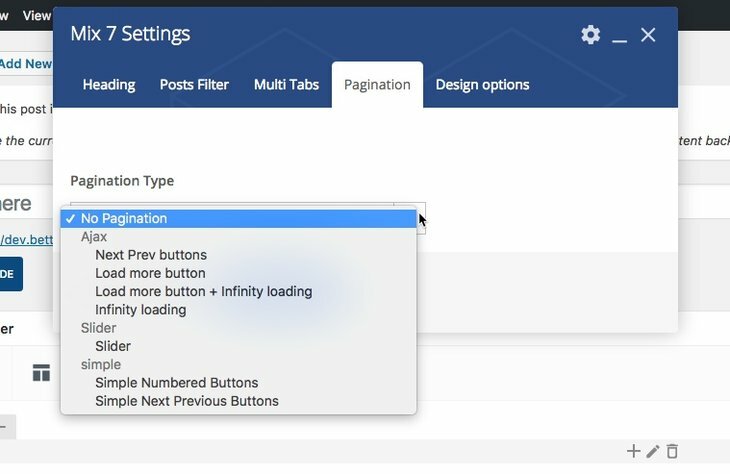 In this section we describe Pagination and Slider. 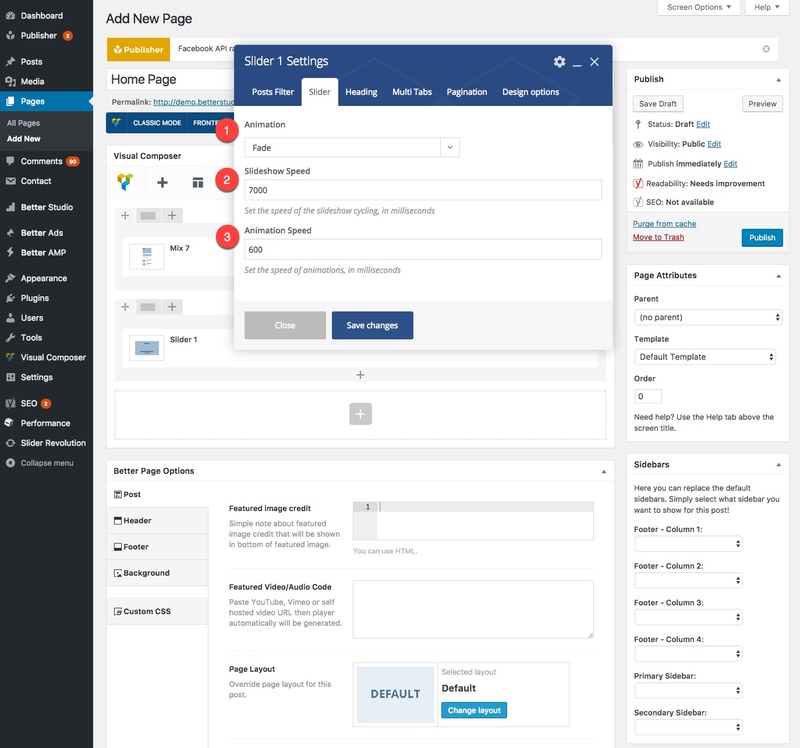 We have “Slider” content block and also “Slider pagination” for non-slider content blocks. Their options are similar. 1- Next Prev buttons: Displaying a pair of simple buttons labeled Next and Prev. Click on them to load new content in the same page. 2- Load more button: The only different with the former is button. Here just one Load More button is displaying. 3- Load more button + infinity loading: Click the Load More button then scroll the page; the posts will load infinitely. 4- Infinity loading: Just scroll the page to load more content. 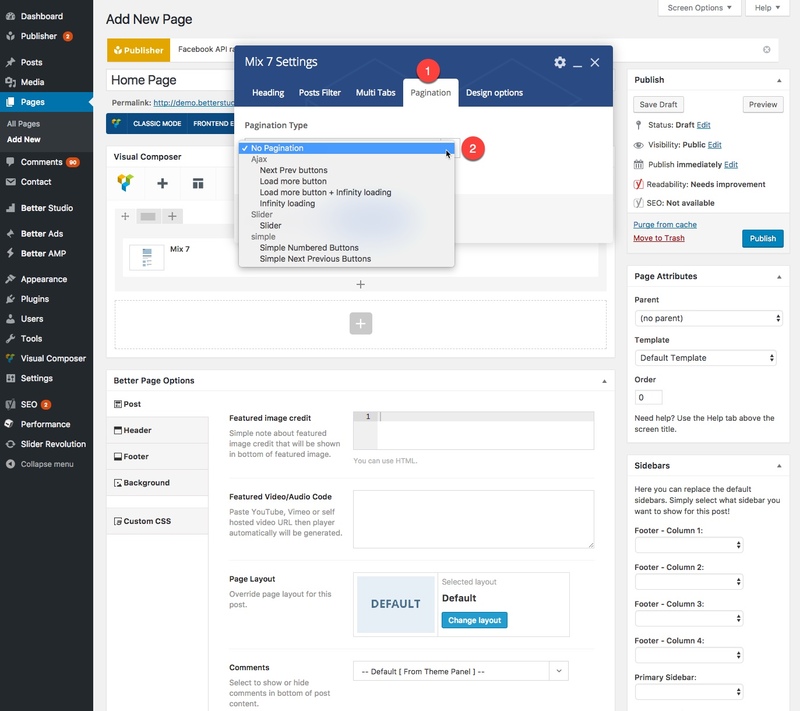 By selecting slider pagination, new content will display as slider. We describe options in more detail. 1- Number of slides: How many slides you want to create and display. Pay attention to number of selected posts. 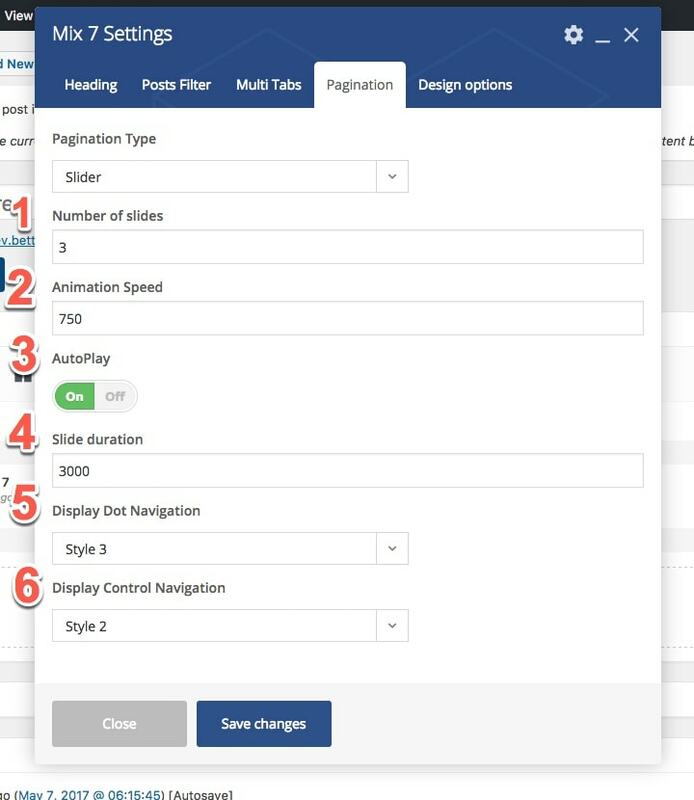 For example in Post Filter, you selected 4 posts by ID or selected a category which contains 4 posts, also each slider shows 4 posts; now there would be no slider show, because there are not enough posts for that. 2- Animation Speed: The time animation endures (in millisecond). 3- AutoPlay: If you set it off, changing slides is just possible by clicking next and previous buttons. 4- Slide Duration: The time every slide is displaying (in millisecond). 5- Display Dot Navigation: Show some dots on slider to notify which slider you are seeing. 6- Display Control Navigation: Show buttons for changing between sliders. If you select “off” in option 3, and select “Don’t Show” for options 5 & 6, then switching between sliders in only possible by grabbing it and slide to right and left without any visual sign! 1- Simple Numbered Buttons: Shows an array of simple numbered buttons. Click on them, new content and new page will load. 2- Simple Next Previous Buttons: Show two buttons for loading newer and older posts. When you select simple pagination, it navigates you to homepage archive, with a permalink like this www.domain.com/page/2/. It means, this page is archive page of all your posts. You may selected specific taxonomy for your content block but buttons navigate you to posts archive. If you select Slider content block you will see a tab labeled Slider. We describe its options. 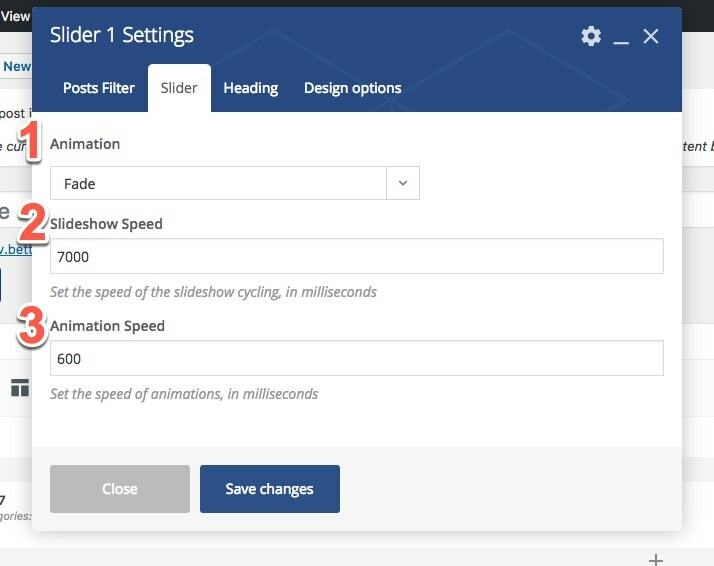 1- Animation: Choose between two effect for changing slides: fade or slide. 2- Slideshow Speed: The time every slide is displaying (in millisecond). 3- Animation Speed: The time animation endures (in millisecond). Other tabs in slider content block are the same as other content blocks.